Here you are a preview of the workshops in program at LPM 2018 Rome. 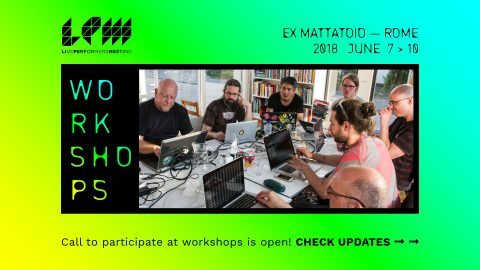 The meeting begins on June 7, 2018 in the spaces of EX Mattatoio. Learning activities will take place in the dedicated classrooms every day starting from 15.00. Read carefully the requirements to attend the classes, choose your activity and register! Workshops are dedicated to learning and sharing, drawing upon the themes of Video Mapping, interactive interfaces using open software and different devices, generative visual with sound and scripts and Resolume, the leader of veejay software. The worksop will be focusing on various techniques inside Max, Max for Live and Live that represent the basis of my audiovisual compositional practice and can be easily extended to performance. These techniques are anchored around a conceptual node that could be called “in-betweenness” – being in-between very opposite compositional practices such as indeterminacy, randomness or probabilities on one hand and planning, total control or repetition on the other. In other words I am influenced by techniques that span from very experimental to very genre based and I will share with you how I bridge that gap using Max, Max for Live and Live. During the workshop we will create few simplified sequences from the LPM 2018 promo video. How to use Live’s time-line to control visuals in Max. How to efficiently analyse audio in Live for the purpose of controlling visuals (tricks with existing Live’s analysis tools and custom made Max for Live devices). How to use Max to add indeterminacy, randomness or non-metric time to your audiovisual language. Generating and processing 3D geometry inside Max using noise and physics based algorithms. Using visuals to control audio (*only if there will be enough time). Each participant needs a laptop with Max, Max for Live and Live installed. Basic knowledge of Max and Live (or some similar equivalents) are recommended. Four days to learn everything related to Video Mapping techniques, from the project idea to the final realization. Technical study, optical, video projectors, lux, blueprint, 2d, 3d, music and sound effects, taught by VJ Eletroiman, member of the Telenoika Community. After a painstaking measurement process, we construct detailed 2D and 3D models of the target surface. We then generate the audio and video content, using these models to “map” the content onto the ﬁnest details of the speciﬁc site. This allows us to visually alter the appearance of the architecture – by controlling light, colour and surface volume – to change its very nature and transform the way it’s perceived. Processing is an open-source, free computer language which was designed to create visual output. Plus, it is a perfect language to learn how to program. This workshop introduces the basic concepts of coding, to afterwards focus on the creative possibilities of processing. After this workshop, each participant knows the fundamental principles of coding in processing, and has created an own small sketch. Ever wonder to play video game with something else than a remote ? Ever tried to map your game on real life object ? Participants need to come with their own mac computer (OSx10.9 or more) and video adapter. We will share our interactive devices, but personal devices are more than welcome. We will bring temporary licenses for the software we will use (Millumin). English will be the main language. The workshop aims to teach the foundations related to the world of LED and related applications in the visual and artistic fields. After a first introductory part and a theory of light, we will touch the world of LEDs, starting from the stripled up to professional led bars and parled. Configuration and setting of the various components: ArtNet, Network Card, Midi. Finally, the participants will be divided into groups, each of which will have to deal with designing and creating a sculpture of light, composed of led bars and parlded. The final part of the workshop will be the various performances of the groups. The Resolume Arena 6 workshop introduces to the participants the use of the new released version of the Resolume Arena Media Server software, the most used tool for managing audio visual content at performances, stages, interactive installations. Starting with a basic interface explanation, you will progressively get to learn all the features of the software and get professional suggestions to use Resolume Arena 6 at its best. You will also get a deep review of all the new features that this new version brings with. During the workshop you will be asked to practice and try by yourself what you are learning. The next step of the class will be focused on the Advance Output including the video mapping and LED mapping techniques using Resolume Arena 6. At the end of the workshop, the participants will be also encouraged to experiment a video mapping on an “object” of their choice. PLEASE NOTE: Participants will be required to bring their own laptop, computer cables for connecting the projector and pc/laptop, and possibly their own projector (if they have one). They may also bring any hardware controller. To bring their own video footage for projection is not required, but welcome.